CTD (water chemistry) data visualized along the Kodiak line. My wife and I have traveled to Raspberry and Kodiak Islands twice. The island’s raw beauty, verdant colors, and legendary fishing make it one of my favorite places on Earth. Its forests are dense, with huge hemlocks and thick growths of salmon berries. The slopes are steep and covered with lush grasses. Fish and wildlife abound. 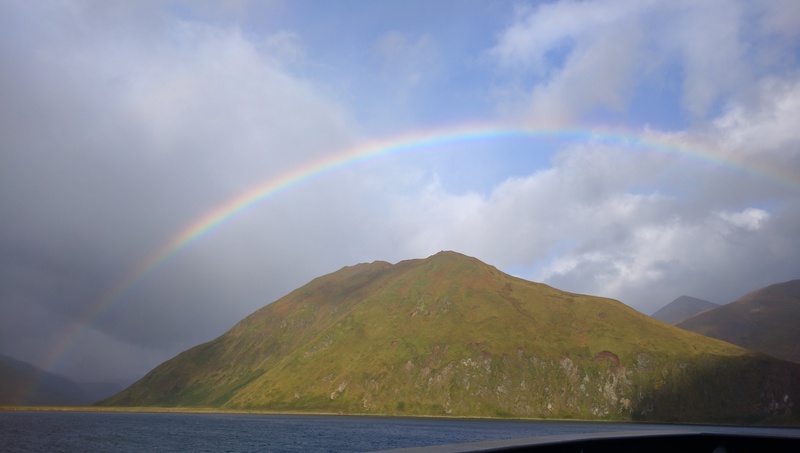 As we moved our way down the Kodiak line, getting closer and closer to land, that richness of life was reflected in waters surrounding the Island. In just fifty nautical miles we moved from a depth of a few thousand meters to less than one hundred. Seabirds became more abundant, and we saw large groups of sooty and Buller’s shearwaters, some of them numbering in the thousands. Sooty shearwaters nest in the southern hemisphere and travel half way across the planet to feed in the rich waters surrounding Kodiak. Fin whales were also abundant today, and could be seen feeding in small groups at the surface. Our plankton tows also changed. Deep sea species like lantern fish and Euphausiids disappeared and pteropods became abundant. We caught two species of pteropods that go by the common names – sea butterflies and sea angels. Sea butterflies look like snails with clear shells and gelatinous wings. Sea angels look more like slugs, but also swim with a fluttering of their wings. Pteropods are an important part of the Gulf of Alaska Ecosystem, in particular to the diets of salmon. 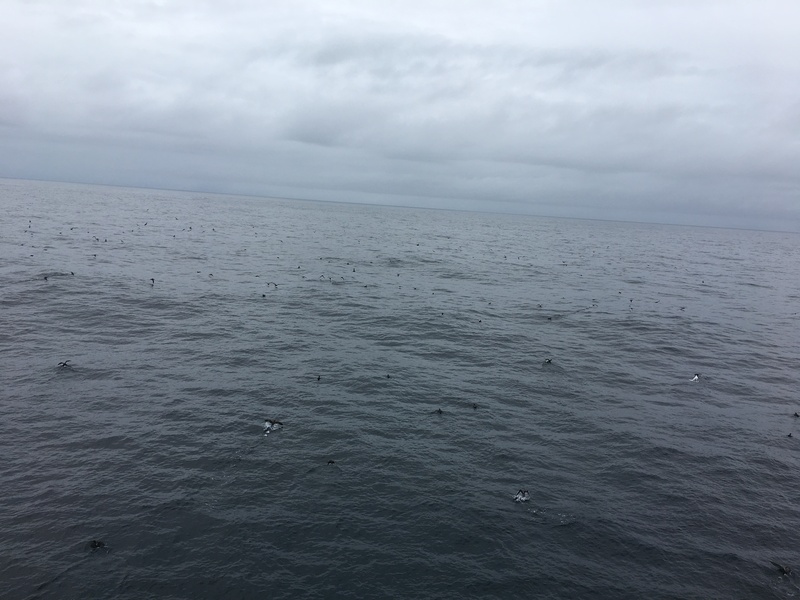 Sooty shearwaters as far as you can see. In the last decade, scientists have become aware that the ocean’s pH is changing, becoming more acidic. Sea water, like blood, is slightly basic, typically 8.2 on the pH scale. As we have added more and more CO2 into the atmosphere, about half of that gas has dissolved into the oceans. When CO2 is dissolved in sea water if forms carbonic acid, and eventually releases hydrogen ions, lowering the waters pH. In the last decade, sea water pH has dropped to 8.1 and is predicted to be well below 8 by 2050. 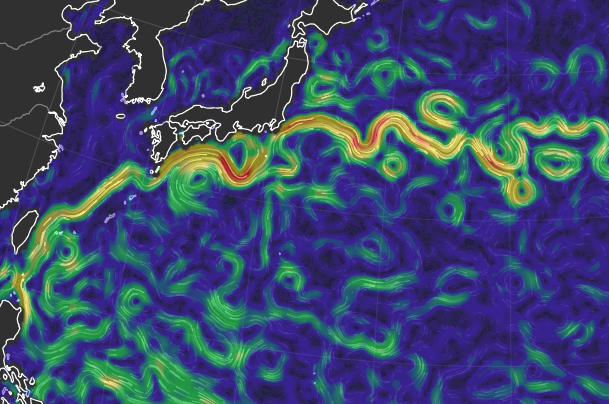 A one tenth change in pH may not seem like much, but the pH scale is logarithmic, meaning that that one tenth point change actually represents a thirty percent increase in the ocean’s acidity. Pteropods are particularly vulnerable to these changes, as their aragonite shells are more difficult to make in increasingly acidic conditions. We have been at sea now for one week. I feel adrift without the comforts and routines of family, exercise, and school. There are no distractions here, no news to follow, and no over-scheduled days. There is just working, eating, and sleeping. Most of the crew and scientists on board seem to really enjoy that routine. I am finding it difficult. There was a point in my twenties where I wanted nothing more than to become a field biologist. I wanted to leave society, go to where the biological world was less disturbed and learn its lessons. I see the same determination in the graduate students aboard the Tiglax. When working, they are always hyper focused on their data and the defined protocols they use to collect it. If anything goes wrong with tow or sampling station, we repeat it. You clearly need that kind of focus to do good research. Over time, cut corners or the accumulation of small errors can become inaccurate and misleading trends. When I was in graduate school hoping to become a marine biologist, I was asked to be teaching assistant to an oceanography class for non-science majors. Never having considered teaching, the experience opened my eyes to the joys of sharing the natural world with others, and changed my path in ways that I don’t regret. I am a teacher; over the last twenty years it has come to define me. On this trip, they call me a Teacher at Sea, yet the title is really a misnomer. I have nothing to teach these people, they are the experts. Really, I am a student at sea, trying to learn all that I can about each thing I observe and each conversation I have. 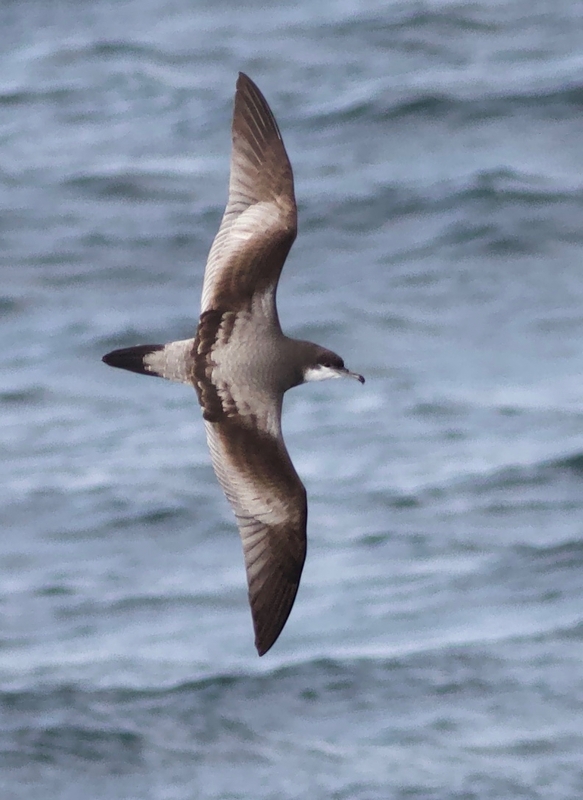 Buller’s shearwater, photo credit Callie Gesmundo. 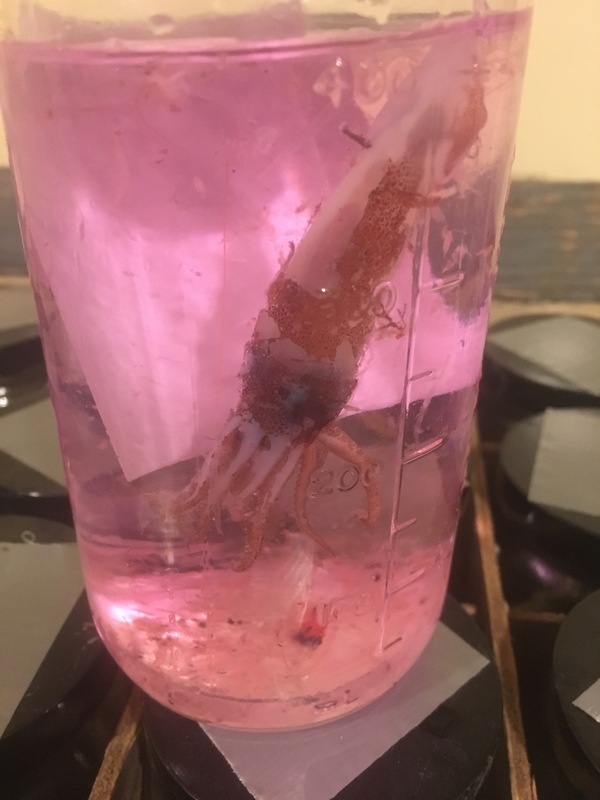 The North Gulf of Alaska Long-term Ecological Research Project collects zooplankton in several different ways. The CalVET Net is dropped vertically over the side of the boat to a depth of 100 meters and then retrieved. This net gives researchers a vertical profile of what is going on in the water column. The net has very fine mesh in order to collect very small plankton. Some of these samples are kept alive for later experiments. Others are preserved in ethanol for later genetic analysis. One of the scientists aboard is interested in the physiological details of what makes copepods thrive or not. 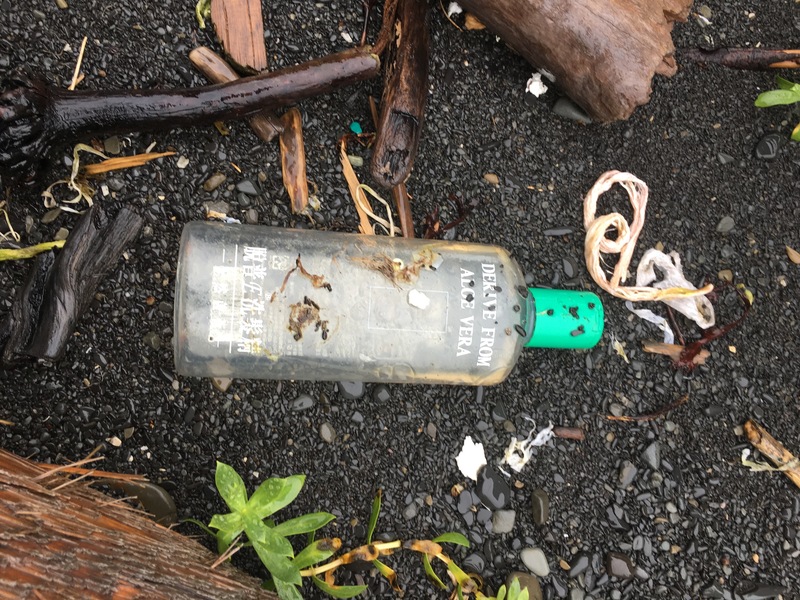 Copepods are so important to the food webs of the Gulf of Alaska, that their success or failure can ultimately determines the success or failure of many other species in the ecosystem. When “the blob” hit the Gulf of Alaska in 2014-2016, thousands and thousands of sea birds died. During those same years, copepods were shown to be less successful in their growth and egg production. The second net used to collect zooplankton is the Multi-net. We actually use two different Multi-nets. The first is set up to do a vertical profile. 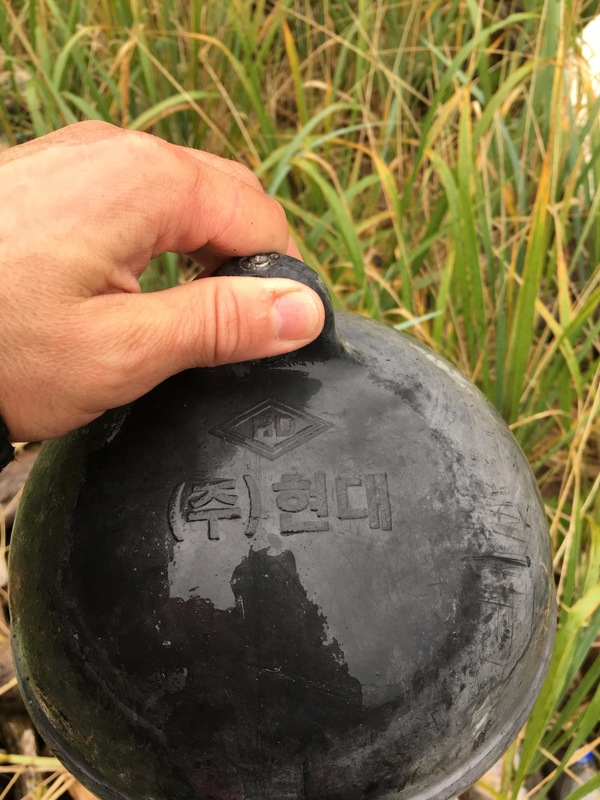 In the morning, it’s dropped vertically behind the boat. Four or five times a night, we tow the second Multi-net horizontally while the boat moves slowly forward at two knots. This allows us to collect a horizontal profile of plankton at specific depths. If the water depth is beyond 200 meters, we will lower the net to that depth and open the first net. The first net samples between 200 and 100 meters, above 100 meters we open the second net. As we go up each net is opened in decreasing depth increments, the last one being very close to the surface. Once the net is retrieved, we wash organisms down into the cod end, remove the cod end, and preserve the samples in glass jars with formalin. In a busy night, we may put away twenty-five pint-sized samples of preserved zooplankton. When those samples go back to Fairbanks they have to be hand-sorted by a technician to determine the numbers and relative mass of each species. We are talking hours and hours of time spend looking through a microscope. One night of work on the Tiglax may produce one month of work for technicians in the lab. Underwater footage of a Multi-net triggering. The last type of net we use is a Bongo net. Its steel frame looks like the frame of large bongo drums. Hanging down behind the frame is two fine mesh nets, approximately seven feet long terminating in a hard plastic sieve or cod end. 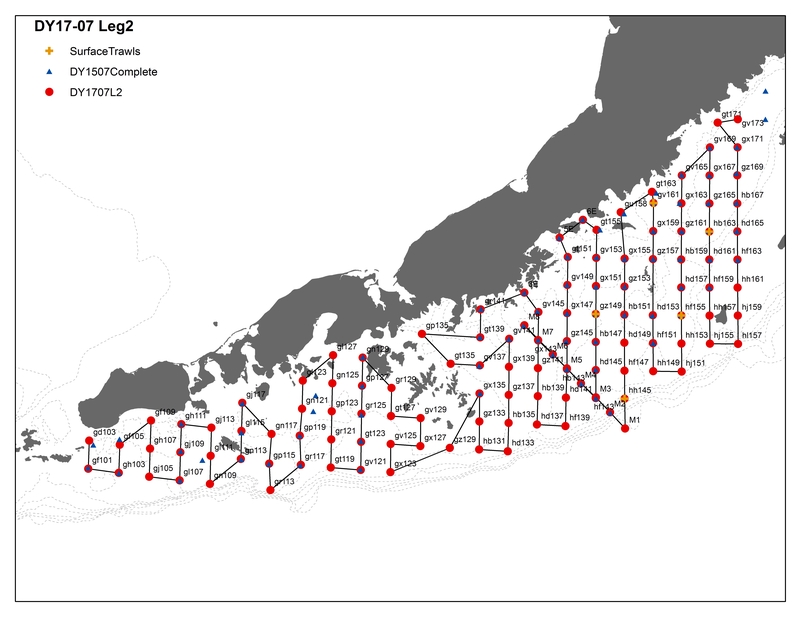 Different lines use different nets based on the specific questions researchers have for that transect line or the technique used on previous years transects. To maintain a proper time series comparison from year to year, techniques and tools have to stay consistent. I’ve spent a little bit of time under the microscope looking at some of the zooplankton samples we have brought in. They are amazingly diverse. The North Gulf of Alaska has two groups of zooplankton that can be found in the greatest abundance: copepods and euphausiids (krill.) 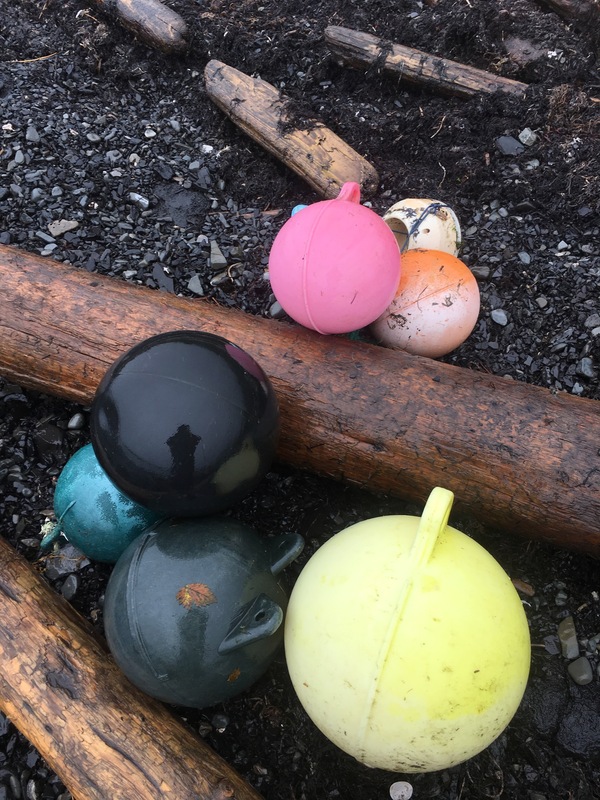 These are food for most other animals in the North Gulf of Alaska. Fish, seabirds, and baleen whales all eat them. Beyond these two, I was able to observe the beating cilia of ctenophores and the graceful flight of pteropods or sea angels, the ghost-like arrow worms, giant-eyed amphipods, and dozens of others. By far my favorite zooplankton to watch under the microscope was the larvae of the goose neck barnacle. Most sessile marine organisms spend the early, larval stage of their lives swimming amongst the throngs of migrating zooplankton. Barnacles are arthropods, which are defined by their exoskeletons and segmented appendages. Most people would recognize barnacles encrusting the rocks of their favorite coastline, but when I show my students videos of barnacles feeding most are surprised to see the delicate feeding structures and graceful movements of this most durable intertidal creature. When submerged, barnacles open their shells and scratch at particles in the water with elongated combs that are really analogous to legs. The larva of the goose neck barnacle has profusely long feeding appendages and a particularly beautiful motion as it feeds. We have to “fish” for zooplankton at night for two reasons. The first is logistical. Some work needs to get done at night when the winch is not being used by the CTD team. The second is biological. Most of the zooplankton in this system are vertical migrators. They rise each night to feed on phytoplankton near the surface and then descend back down to depth to avoid being seen in the daylight by their predators. This vertical migration was first discovered by sonar operators in World War II. While looking for German U-boats, it was observed that the ocean floor itself seemed to “rise up” each night. After the war, better techniques were developed to sample zooplankton, and scientists realized that the largest animal migration on Earth takes place each night and each morning over the entirety of the ocean basins. One of my favorite videos on plankton. 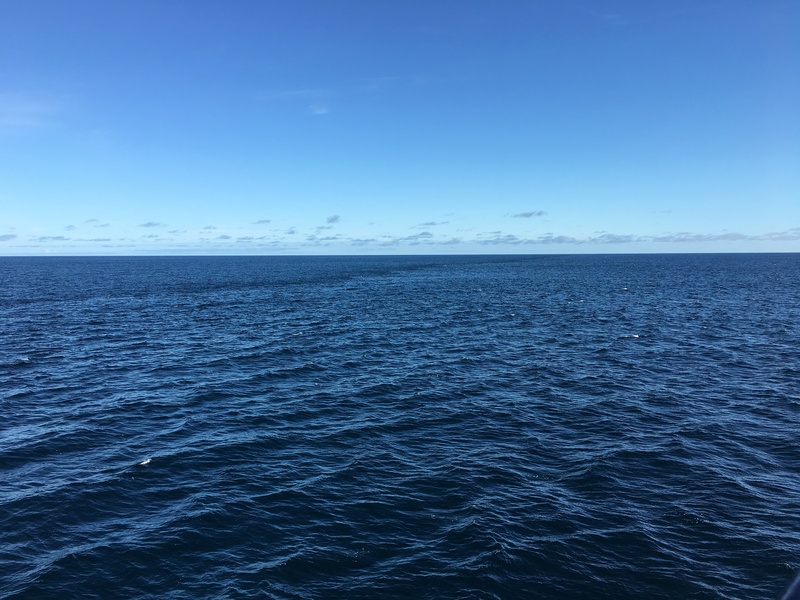 This far offshore, the water we are traveling through is almost perfectly clear, yet the color of the ocean seems continuously in flux. Today the sky turned gray and so did the ocean. As the waves come up, the texture of the ocean thickens and the diversity of reflection and refraction increases. Look three times in three directions, and you will see three hundred different shades of grey or blue. If the sun or clouds change slightly, so does the ocean. The sea is anything but consistent. Rips or streaks of current can periodically be seen separating the ocean into distinct bodies. So far in our trip, calm afternoons have turned into windy and choppy evenings. Still, the crew tells me that by Gulf of Alaska standards, we are having amazing weather. Variations in water texture created by currents in the Gulf of Alaska. The bodies of puffins are much better adapted to diving than flying. A puffin with a full belly doesn’t fly to get out of the way of the boat so much as butterfly across the surface of the water. Michael Phelps has nothing on a puffin flapping its way across the surface of the water. Most of my students know that the sun provides the foundational energy for almost all of Earth’s food webs. Yet many students will get stumped when I ask them, where does the mass of a tree comes from? The answer of course is carbon dioxide from the air, but I bet you already knew that. Scientists use the term “primary productivity” to explain how trees, plants, and algae take in carbon dioxide and “fix it” into carbohydrates during the process of photosynthesis. Out here in the Gulf of Alaska, the primary producers are phytoplankton (primarily diatoms and dinoflagellates). When examining diatoms under a microscope, they look like tiny golden pillboxes, or perhaps Oreos if you are feeling hungry. Primary productivity experiments running on the back deck of the Tiglax. 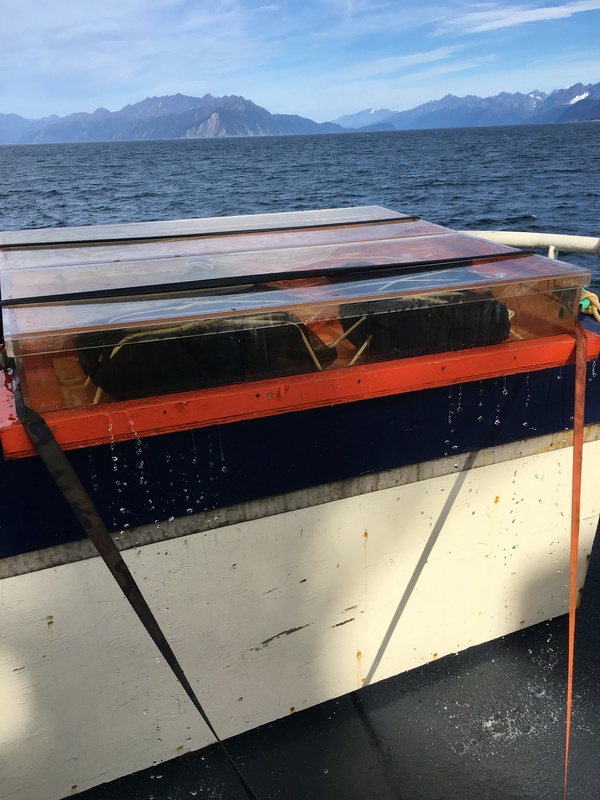 One of the teams of scientists on board is trying to measure the rates of primary productivity using captive phytoplankton and a homemade incubation chamber. They collect phytoplankton samples, store them in sealed containers, and then place them into the incubator. Within their sample jars, they inject a C13 isotope. After the experiment has run its course, they will use vacuum filtration to separate the phytoplankton cells from the seawater. Once the phytoplankton cells are captured on filter paper they can measure the ratios of C12 to C13. Almost all of the carbon available in the environment is C12 and can be distinguished from C13. The ratios of C12 to C13 in the cells gives them a measurement of how much dissolved carbon is being “fixed” into sugars by phytoplankton. Apparently using C14 would actually work better but C14 is radioactive and the Tiglax is not equipped with the facilities to hand using a radioactive substance. During the September survey, phytoplankton numbers are much lower than they are in the spring. The nutrients that they need to grow have largely been used up. Winter storms will mix the water and bring large amounts of nutrients back to the surface. 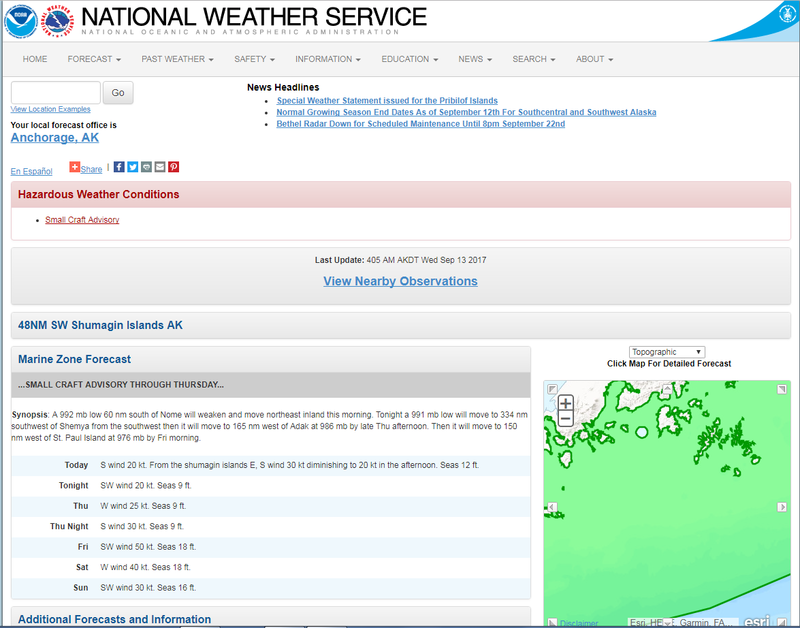 When sunlight returns in April, all of the conditions necessary for phytoplankton growth will be present, and the North Gulf of Alaska will experience a phytoplankton bloom. It’s these phytoplankton blooms that create the foundation for the entire Gulf of Alaska ecosystem. The night shift is not getting any easier. The cumulative effects of too little sleep are starting to catch up to me, and last night I found myself dosing off between plankton tows. The tows were more interesting though. 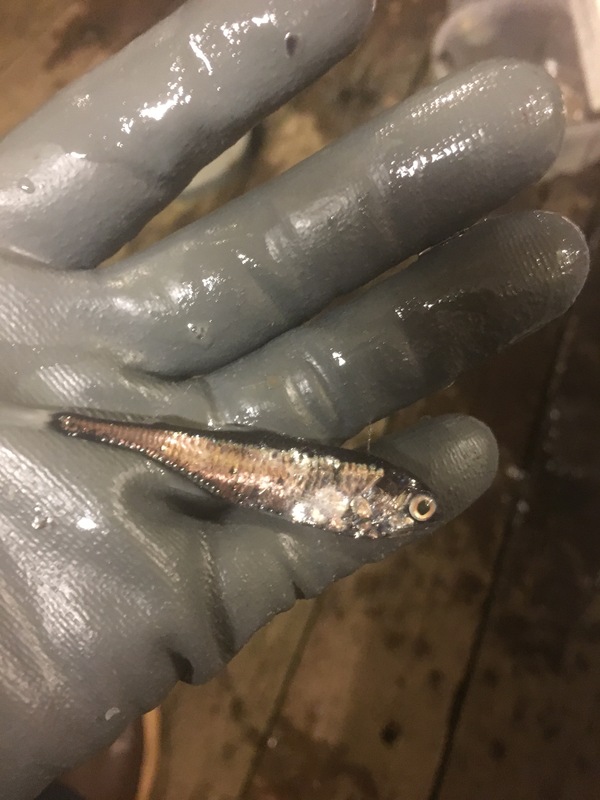 Once we got past the edge of the continental shelf, the diversity of zooplankton species increased and we started to see lantern fish in each of the tows. Lantern fish spend their days below one thousand feet in the darkness of the mesopelagic and then migrate up each night to feed on zooplankton. The have a line of photophores (light producing cells) on their ventral sides. When they light them up, their bodies blend in to the faint light above, hiding their silhouette, making them functionally invisible. A lantern fish with its bioluminescent photophores visible along its belly. Once I am up in the morning, the most fun place to hang out on the Tiglax is the flying bridge. Almost fifty feet up and sitting on top of the wheelhouse, it has a cushioned bench, a wind block, and a killer view. 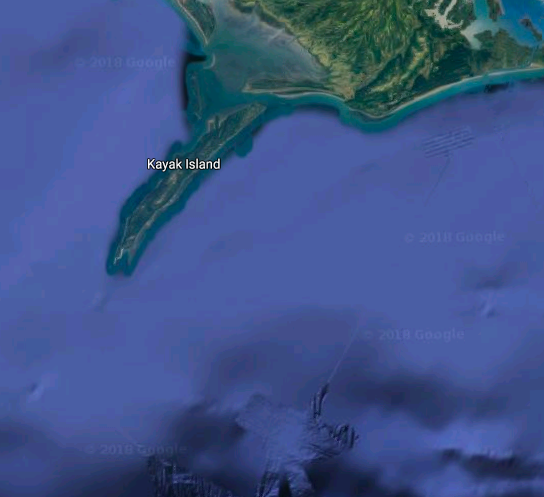 This is where our bird and marine mammal observers work. Normally there is one U.S. Fish and Wildlife observer who works while the boat is transiting from one station to the next. On this trip, there is a second observer in training. The observers’ job is to use a very specific protocol to count and identify any sea bird or marine mammal seen along the transect lines. 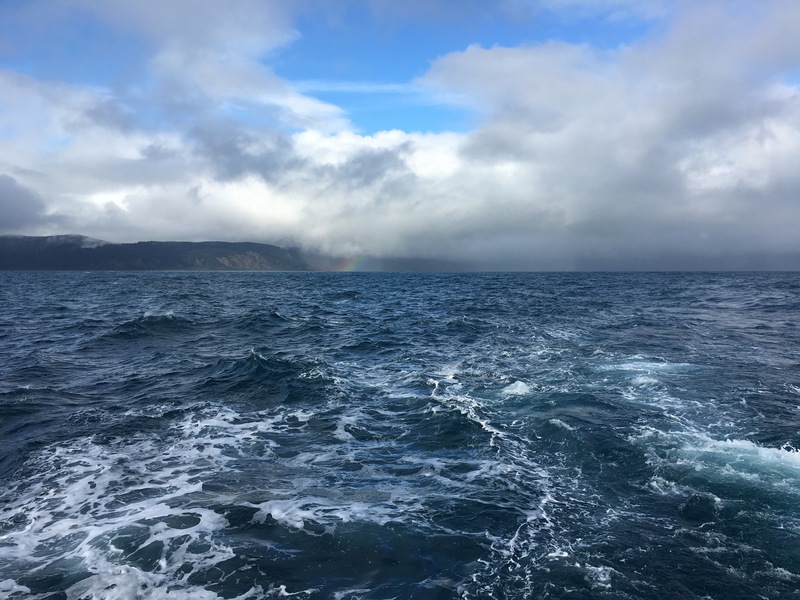 Today we saw lots of albatross; mostly black-footed, but a few Laysan, and one short-tailed albatross that landed next to the boat while were casting the CTD. The short-tailed albatross was nearly extinct a few years ago, and today is still considered endangered. That bird was one of only 4000 of its species remaining. 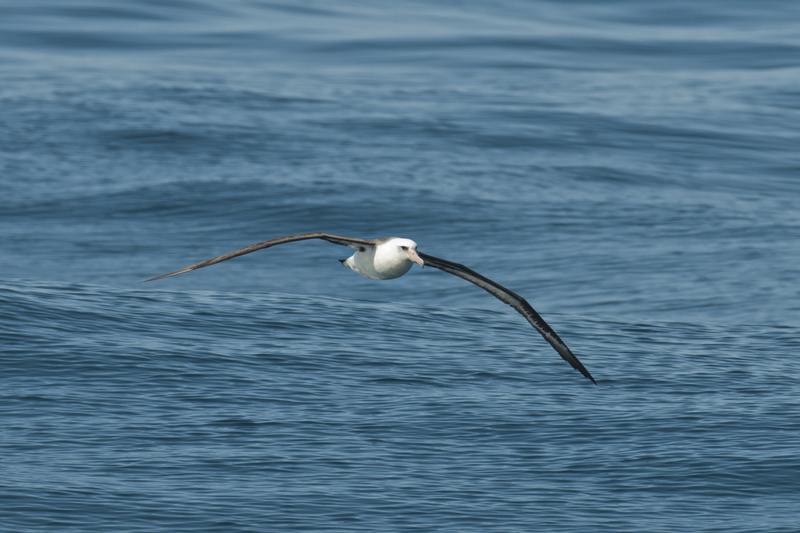 Albatross have an unfortunate tendency to follow long-line fishing boats. They try to grab the bait off of hooks and often are drowned as the hooks drag them to the bottom. Albatross are a wonder to watch as they glide effortlessly a few inches above the waves. They have narrow tapered wings that are comically long. When they land on the water, they fold their gangly wings back in a way that reminds me of a kid whose growth spurts hit long before their body knows what to do with all of that height. While flying, however, they are a picture of grace and efficiency. They glide effortlessly just a few inches above the water, scanning for an unsuspecting fish or squid. When some species of albatross fledge from their nesting grounds, they may not set foot on land again for seven years, when their own reproductive instincts drive them to land to look for a mate. Our birders seem to appreciate anyone who shares their enthusiasm for birds and are very patient with all of my “What species is that?” questions. They have been seeing whales as well. Fin and sperm whales are common in this part of the gulf and they have seen both. Albatross, along with many other sea birds, have life spans comparable to humans. It’s not uncommon for them to live sixty or seventy years, and they don’t reach reproductive maturity until well into their teens. It’s also given me a few days to reflect on the incredible experience I had at sea. Science is a collaborative. Many people do not realize the amount of teamwork that goes into the scientific process. For instance, several of the scientists on board my cruise don’t actually study Pollock. One of the guys studies Salmon, but he was still on the cruise helping out. I think that’s what really struck me. The folks from the NOAA Northwest Fisheries Science Center pull together as a team to make sure that everyone gets the data they need. They all jump on board ships to participate in research cruises even if it’s not their specific study area, and it’s quite likely someone else is in another location doing the same thing for them. At the end of the day, it’s the data that matters and not whose project it is. Since returning home, the most frequent question I have received is “what was your favorite part?” At first, I didn’t know how to answer this question. To have such an incredible experience crammed into two weeks, makes it difficult to narrow it down. After a few days of reflection, I finally have an answer. The onboard relationships were my favorite part of my Teacher at Sea cruise. I appreciated that the entire crew took me under their wing, showed me the ropes, and made 12 hour shifts sorting through jellyfish for Pollock fun! This is the only place where I could have the opportunity to work and live with scientists in such close proximity. I was fascinated by each scientist’s story: how they got into their specialty, what their background is, why they feel what they’re doing is important, etc. I learned that 10 pm became the silly hour when the second cup of coffee kicked in along with the dance music. I learned that beyond Pollock research these folks were also rescuers taking in tired birds that fell onto the ship, warming them up, and then releasing them. When the next person asks “what was your favorite part?” I will be ready with an answer along with a big smile as I remember all the goofy night shifts, the incredible inside look at sea based research, and the wonderful people I met. Oh, and the views. The view from Captain’s Bay near Dutch Harbor, Alaska before a big storm blew in. Up. Down. Up. Down. Left. Right….no I’m not in an aerobics class. High winds and seas cause my chair to slide across the floor as I type. Thus far we’ve been working 12 hour shifts, 24 hours a day. Today we’re sitting about twirling our thumbs as 12 feet seas toss us about. 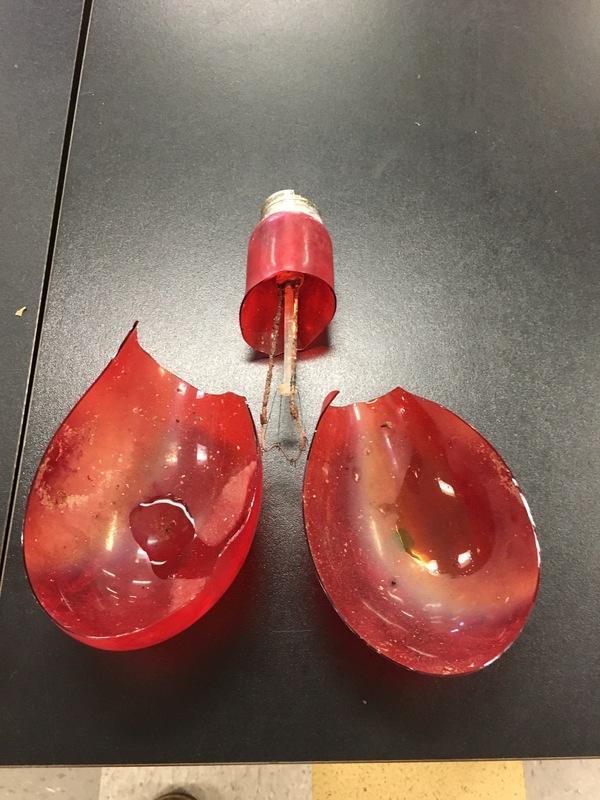 It’s not too bad actually, but it is bad enough to make operations unsafe for both crew and equipment. I’ve been impressed with the safety first culture on-board the Oscar Dyson. Hopefully, it’ll calm down soon, and we can start operations again. 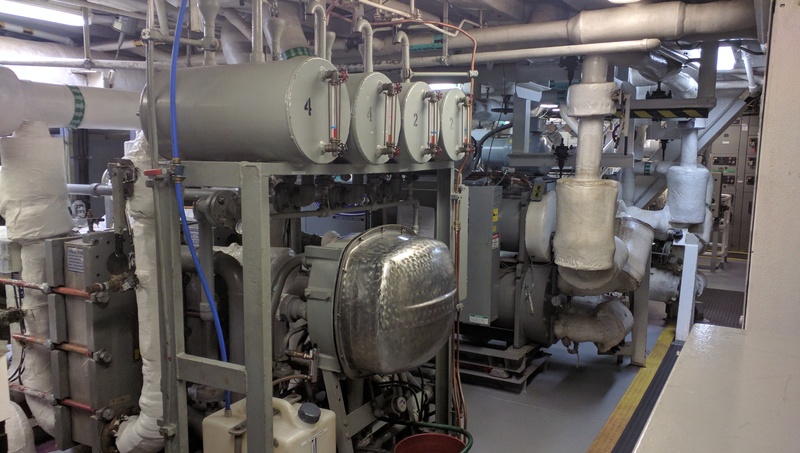 Ship support systems for power, water, sewage treatment, and heating/cooling are all several levels below the main deck, which makes ship engineers a bit like vessel moles. These hard working guys ensure important life support systems work smoothly. 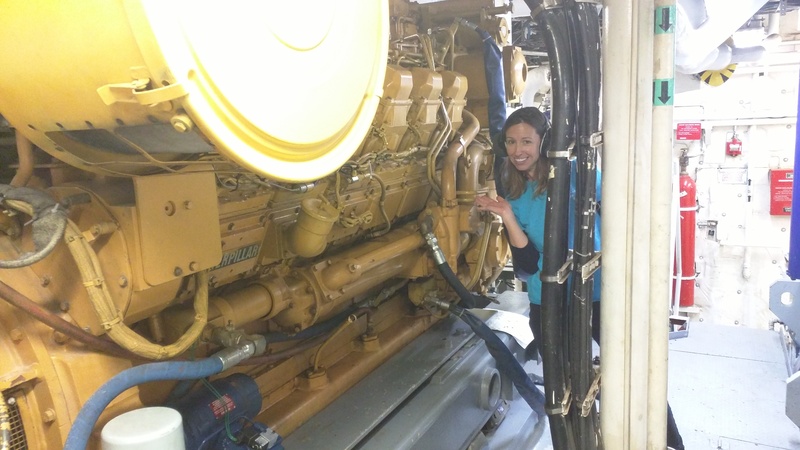 Highlights from my time with them include a lesson on the evaporator and engines. The evaporator, which for some reason I keep calling the vaporizer, produces the fresh water drinking supply. The evaporator works by drawing in cold seawater and then uses excess engine heat to evaporate, or separate, the freshwater from the seawater. The remaining salt is discarded as waste. On average, the evaporator produces approximately 1,400 gallons of water per day. *Side note: the chief engineer decided vaporizer sounds a lot more interesting than evaporator. Personally, I feel like vaporizer is what Star Trek-y people would have called the system on their ships. The Oscar Dyson has 4 generators on board, two large, and two small. The generators are coupled with the engines. Combined they produce the electricity for the ship’s motors and onboard electrical needs, such as lights, computers, scientific equipment, etc. I even got to see the prop shaft. This week I also spent time in the Galley with Ava and Adam. (For those of you who know me, it’s no surprise that I befriended those in charge of food.) Read on for a summary of Ava’s life at sea story. Me: How did you get your start as a galley cook? Ava: When I was about 30 years old, a friend talked me into applying to be a deck hand. Me: Wait. A deck hand? Ava: That’s right. I was hired on to a ship and was about to set out for the first time when both the chief steward and 2nd cook on a different ship quit. My CO asked if I cook to which I replied “for my kids,” which was good enough for him. They immediately flew me out to the other ship where I became the 2nd cook. 12 years later I’m now a Chief Steward. Me: Wow! Going from cooking for your kids to cooking for about forty crew members must have been a huge change. How did that go? Ava: To be honest, I made a lot phone calls to my mom that first year. She helped me out a lot by giving me recipes and helping me figure out how to increase the serving sizes. Over the years I’ve paid attention to other galley cooks so I now have a lot of recipes that are my own and also borrowed. Me: What exactly does a Chief Steward do? Ava: The Chief Steward oversees the running of the galley, orders food and supplies, plans menus, and supervises the 2nd Cook. I’m a little different in that I also get in there to cook, clean, and wash dishes alongside my 2nd Cook. I feel like I can’t ask him to do something that I’m not willing to do too. Me: So you didn’t actually go to school to be a chef. Did you have to get any certifications along the way? Ava: When I first started out, certifications weren’t required. Now they are, and I have certifications in food safety and handling. There are schools for vessel cooking though. My daughter just recently graduated from seafarers school. The school is totally free, except for the cost of your certification at the very end. For people interested in cooking as a career, it’s a great alternative to other, more expensive college/culinary school options. Now she’s traveling the world, doing a job she loves, and putting a lot of money into her savings. Me: Talking with crew members on this ship, the one thing they all say is how hard it is to be away from family for long stretches of time. A lot of them are on the ship for ten months out of the year, and they do that for years and years. It’s interesting that your daughter decided to follow in your footsteps after experiencing that separation firsthand. Ava: I was surprised too. Being away from friends and family is very hard on ship crew. Luckily for me, my husband is also part of the NOAA crew system so we get to work and travel together. Nowadays I’m part of the augment program so I get to set my own schedule. It gives me more flexibility to stay home and be a grandma! Nautical miles are based on the circumference of the earth and is 1 minute of latitude. 1 nautical mile equals 1.1508 statue miles. 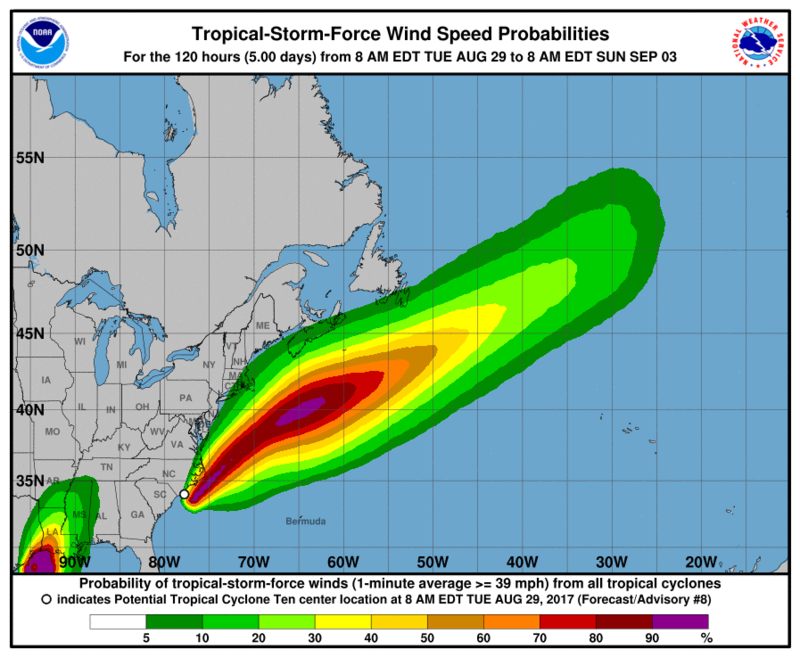 Currently Virginia Beach is experiencing Potential Tropical Cyclone 10. The temperature is topped out at 75°F. The winds are out of the NE at about 13 mph right now. That’s expected to increase to 25-35 mph with gusts up to 50 mph this afternoon. Forecasts predict mild flash flooding and some tidal flooding around the 2 pm high tide. 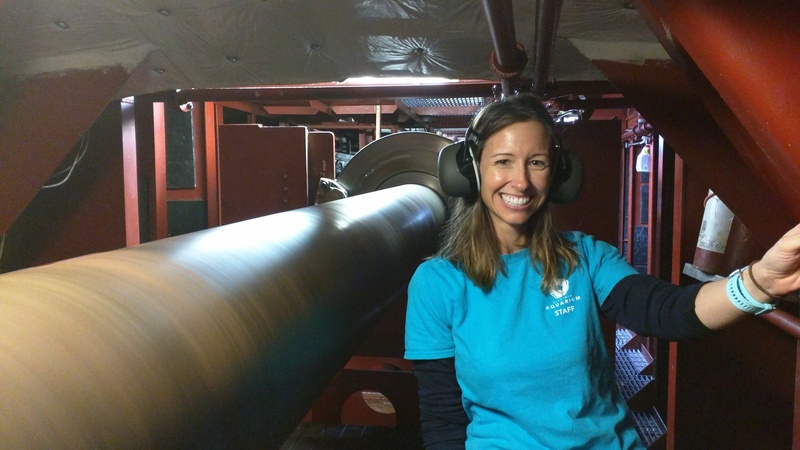 My name is Jenny Smallwood, and I’m a school and youth programs educator at the Virginia Aquarium & Marine Science Center in Virginia Beach, Virginia. I’m in my 11th year as an educator, which included 8 years as a high school science teacher. These days I get to hang out with and educate scouts, school groups, and other visitors to the Aquarium. One of the coolest things I’ve experienced working here is watching as a student sees the ocean for the very first time! It was that experience that helped me realize how important it is to share the oceans and oceanic research with people who can’t experience it themselves. I want to bring my Teacher at Sea experience to those individuals who don’t have the Chesapeake Bay or an ocean in their backyard. I want to help them experience the life of a marine researcher. Outside of my role as an educator, I love to go on all the adventures. My husband, Lee, and I enjoy traveling and have nicknamed ourselves “adventure nerds.” We even have a theme song. Like I said, we’re nerds. I’m super excited about this latest adventure with Teacher at Sea. I’m still amazed that I was one of the few chosen for this year’s research cruises. 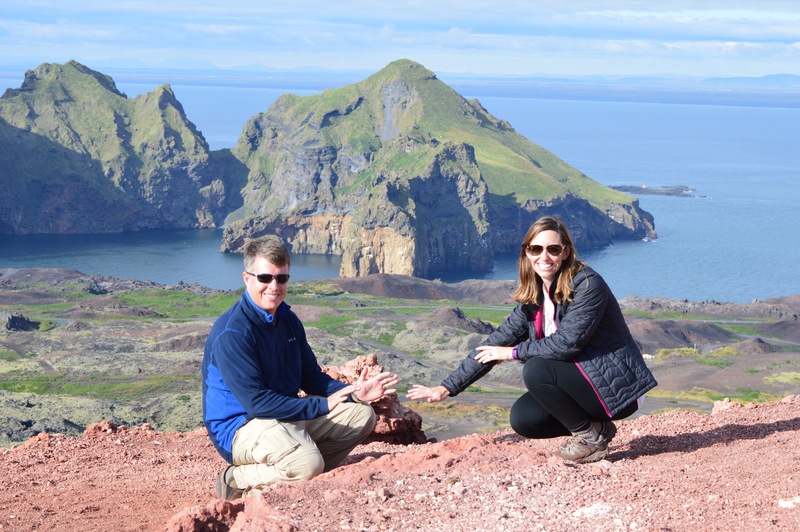 Warming our hands from the heat emitted by Eldfell, a volcano located on the Westman Islands in Iceland. The Oscar Dyson is a NOAA research vessel used for fisheries surveys important to fisheries management. Commissioned in 2005, this 208.6 feet long ultra-quiet survey ship is considered one of the most technologically advanced fisheries survey vessels in the world. That’s right. This ship is super stealthy so we can sneak up on the fish. It also has numerous labs onboard, including a wet, dry, bio, and hydro lab. The Oscar Dyson near Dutch Harbor, Alaska. Courtesy of NOAA. 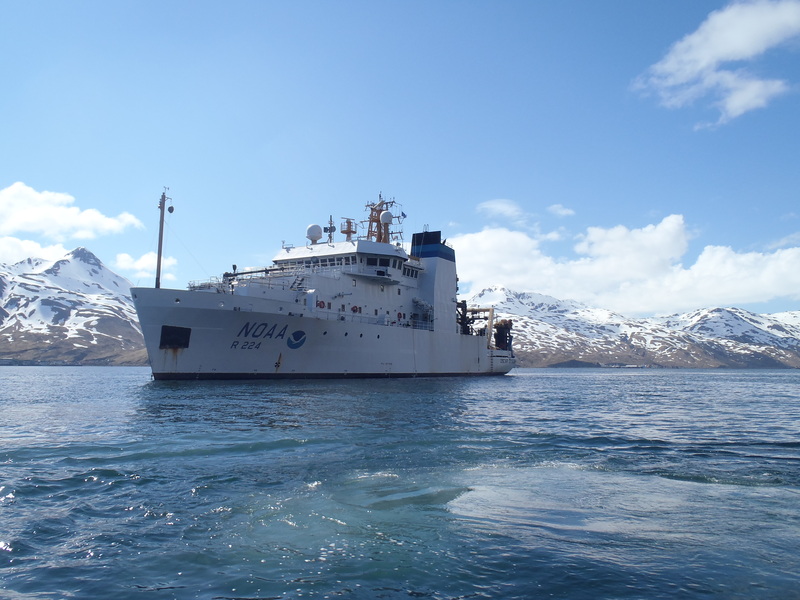 On this trip, the Oscar Dyson will pull out of Kodiak, Alaska and make its way southwest through the Gulf of Alaska to take up position for Leg 2 of the EMA-EcoFOCI Juvenile Walleye Pollock and Forage Fish Survey. What does that mean exactly? Well, it means that scientists will collect Walleye Pollock data to get an idea of what the population looks like. 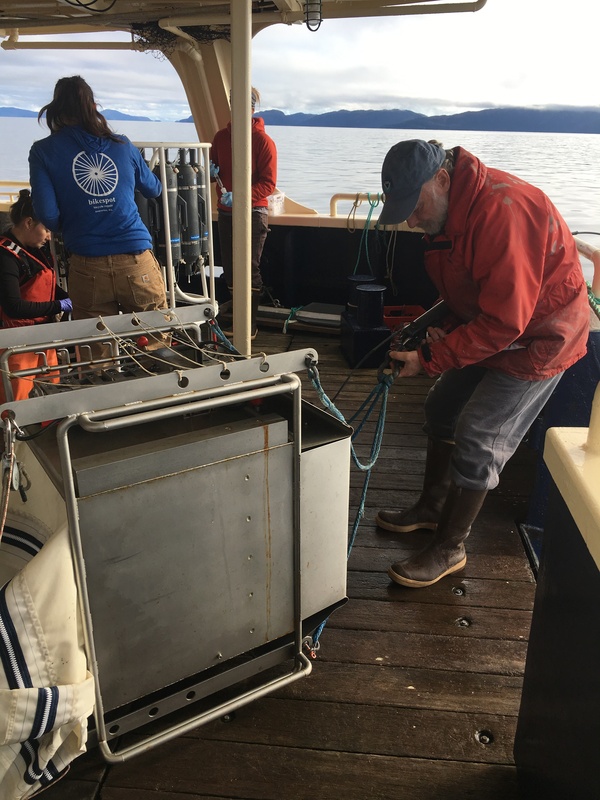 They’ll also take zooplankton samples, smaller prey fish samples, and collect environmental data to see how these factors might be affecting Pollock. Basically scientists and policy makers need information in order to properly manage this fishery, and this is where NOAA comes in. I can’t wait to learn more about the application of this research as scientists learn even more about the ecology of Pollock. 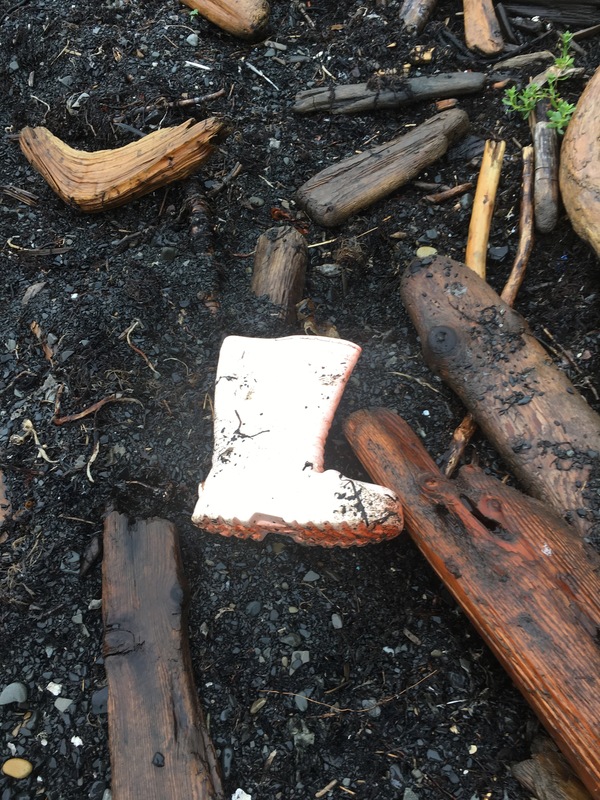 To collect these samples, scientists will be using a variety of tools. Bongo nets will be used to collect zooplankton samples. From what I’ve learned so far, it sounds like specially mounted equipment collects water data along with the plankton. A Stauffer trawl net will be used to sample fish species. 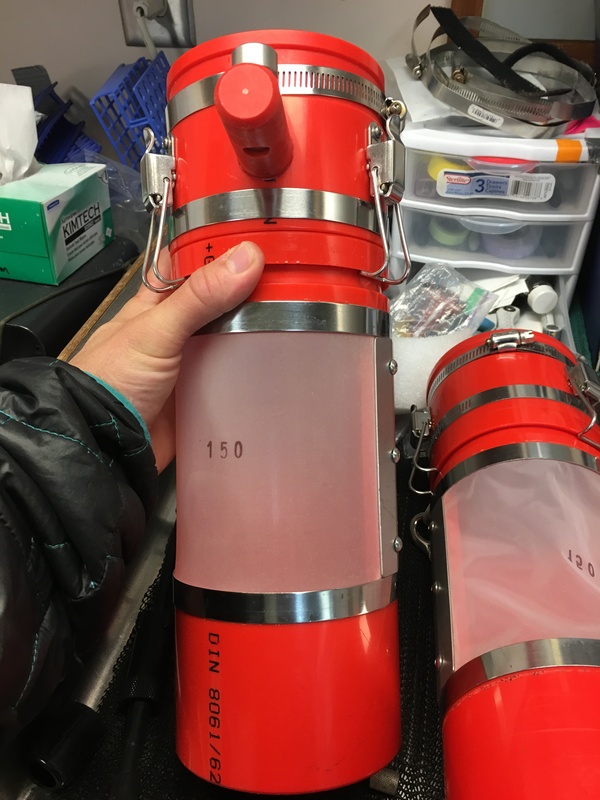 A CTD rosette (CTD stands for conductivity, temperature, and density) will be used along the way to corroborate that the other water data equipment is indeed working correctly. Scientists, like mathematicians, do love to double check their work.